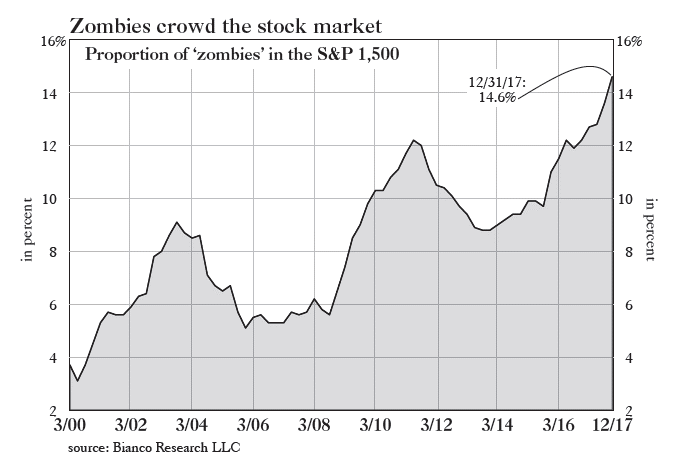 “Zombie Companies” Ready to Devour Stock Market? In the movies, zombies are the scariest creatures of all. In the financial world, zombie companies can bring a similar level of terror and turmoil to the economy and everyone’s investments. Just like their movie counterparts, zombie companies are technically dead, but market conditions allow them to stay animated. Some experts say rising interest rates could lead to the fall of more zombie companies out there than we may know. Zombie companies are those that can’t cover the cost of servicing their debt from current profits. In other words, not only are they unable to make headway paying down principal – they can’t even cover interest payments. The relatively high number of zombie companies in the U.S. is among the less-discussed of potentially deadly factors jeopardizing both the stock market and economy right now. Some experts say these zombies could be a real-life nightmare for the nation in the near term. According to analysis done by Bianco Research, about 15% of the S&P 1500 is populated by zombie companies – stunning. The S&P 1500 includes all companies that comprise the S&P 500, plus those that make up both the S&P 400 and 600. The S&P 1500 represents 90% of the market capitalization of U.S. stocks. Unsurprisingly, zombies flourish during periods of cheap credit, which has characterized the U.S. economic environment for a long time, until very recently. Super-low interest rates make borrowing and debt servicing very easy – a key to the proliferation of the zombies. It’s when rates move up that the truth is revealed about the instability of these entities. Rising rates are what can finally kill a zombie of the corporate variety. Higher interest rates put additional stress on businesses, anyway, but factor in the high level of bona fide zombies that are out there now, and you have a recipe for disaster that can far outsize the more garden-variety negative effects we tend to attribute to a higher-rate climate. Jeffrey Gundlach, known as the “King of Bonds” and founder of asset management company, DoubleLine Capital, recently spoke to an issue intertwined with the zombie problem. He delivered a presentation in which he explained the threat to the market from debt-financed buybacks. Leveraged buybacks involve using debt to buy back outstanding shares from investors. They’ve earned a bad reputation as a way for companies to shore up key metrics such as earnings-per-share without adding any real value to the company or otherwise operationally improving it. As Investopedia points out, more than 40% of growth in earnings-per-share since the financial crisis has come from buybacks. “…the leverage in the corporate economy is very bad. There’s been a lot of buybacks — borrow money at low rates, buy back stocks — which of course, it’s just turning the equity market into a CDO residual, an equity piece, that’s getting thinner and thinner, riskier and riskier. 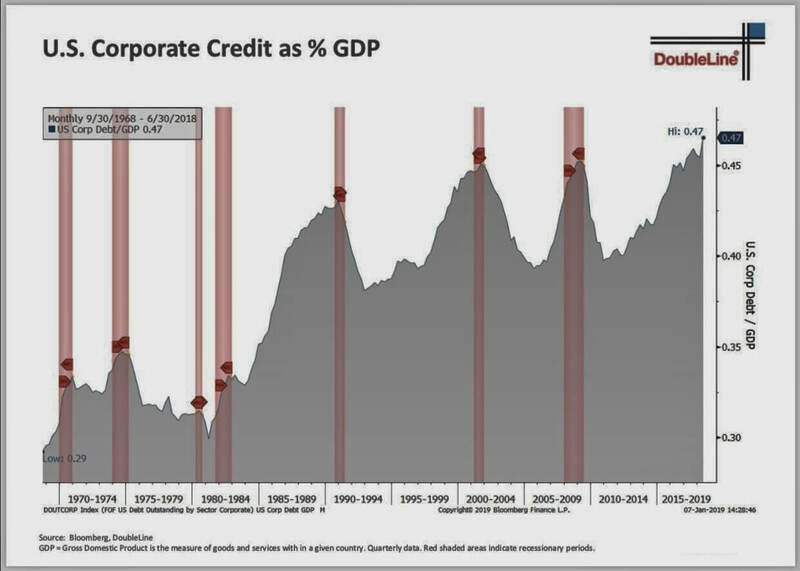 Gundlach is referring, of course, to the collateralized debt obligation (CDO) – the structured, asset-backed credit product viewed as the investment “culprit” of the 2008 financial crisis. I’ve been worried for a while about the effects higher interest rates may have this time around. We’ve written previously about the tough shape typical American families find themselves in right now. Household debt remains exorbitant. Senior citizens, once regarded as the most solvent age demographic, are declaring bankruptcy at a significantly higher rate than they did a few decades ago. The reality is that years of stunningly cheap debt may have turned our country into a veritable zombie nation. Zombie companies are a thing, but so are zombie families, cities, and states. Even the U.S. itself is on the way to becoming a debt zombie. At every level of society, debt that has been manageable solely because of ridiculously low interest rates is getting ready to become onerous as rates rise again. So how do you protect yourself from zombie companies? It is said you protect yourself from actual zombies by destroying their brains. Fortunately, you don’t have to do anything quite so desperate or ghoulish to keep yourself safe from the stock market’s zombies. One way to help insulate your portfolio from the effects of the zombie companies is to add physical precious metals to your asset base. Gold is famously uncorrelated with other major asset classes, which means you could not only neutralize the zombies with physical precious metals but see your portfolio thrive even in the face of their attack when the economy and the stock market potentially are paying a terrible price. Want to learn more about staying safe with physical precious metals? Call Augusta Precious Metals at 855-242-4121 and speak with one of our knowledgeable gold and silver specialists.